Talk to one of the trained consultants here at Blinds & Designs in San Francisco to see if one of the options (or something else) is right for your needs. Vignette Modern Roman Shades combine the exquisiteness of a four-inch full-fold Roman shade with the easy operation of the Vertiglide operating system. If price is your concern, Vertical Solutions offers an economical assortment of verticals in 3½” or S-shaped vanes in dozens of modern styles, patterns, and colors. Vertiglide is a perfect choice for large expanses of windows or sliding doors. Its honeycomb construction offers exceptional energy efficiency and can coordinate with your horizontal honeycomb shades in the same room. 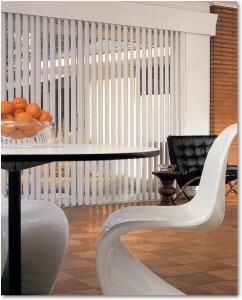 Vertiglide has also been used as a room divider. Crosswinds Wood Vertical Blinds works very well in dens or any room with wood paneling on the wall. They carry the wooden look and blend into the room. If you want contrast, select them in white. Skyline Gliding Panels offers a much larger vane that works well on larger windows and also as a room divider. Because of the larger size of the vanes, it creates a contemporary, sleek look that will update any room. For the look of sheer draperies with the function of a blind, Luminette Privacy Sheers are an excellent choice. Available in a wide variety of sheer drapery-like fabrics, these will give you many privacy and light-control options.